Before she walked away a winner, Tracee Ellis Ross posed on the red carpet yesterday evening(January 16th) at the 49th NAACP Image Awards at the Pasadena Civic Auditorium in Pasadena, CA. 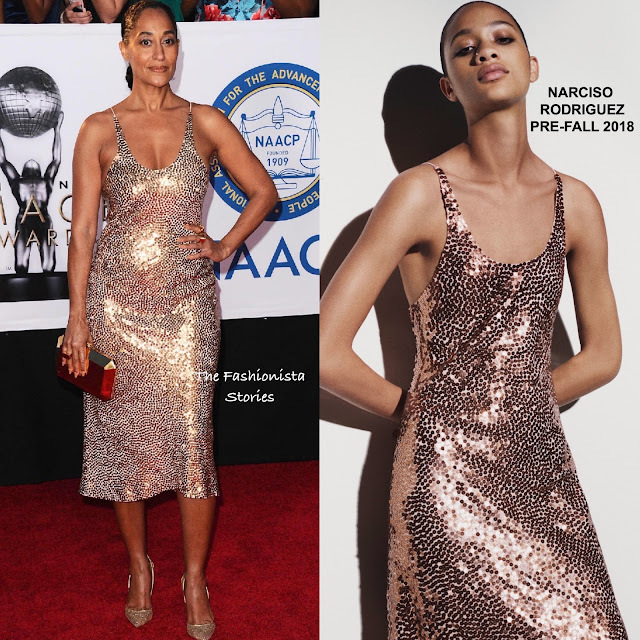 Making a sparkly entrance, she wore a NARCISO RODRIGUEZ PRE-FALL 2018 copper sequin dress which stopped just below her knees. The thing about sequins is sometimes it can photograph unflattering in the mid-section which you can see here on Tracee. However I am not to crazy about the neckline. She finished up with minimal make-up, a braided ponytail, a TIFFANY & CO jewelry, a TYLER ELLIS clutch and CHRISTIAN LOUBOUTIN pumps. What do you think of Tracee's look?